Heroes, Heroines, and History: WOULD YOU HAVE JOINED THE WAVES DURING WORLD WAR II? 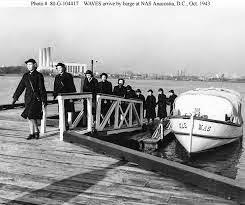 WOULD YOU HAVE JOINED THE WAVES DURING WORLD WAR II? ANNE GREENE HERE. Despite the pain and fear and death that occurred during World War II, women made great strides in financial and personal freedom. The WAVES provided one avenue to those goals. The WAVES could not serve aboard combat ships or aircraft. Initially they were restricted to duty in the United States. Late in the war, they were authorized to serve in certain U.S. possessions, and a number were sent to Hawaii. The war ended before any WAVES could be sent to other locations. Within their first year, the WAVES were 27,000 strong. A large proportion did clerical work, but some took positions in the aviation community, medical professions, communications, intelligence, storekeeper and technology. 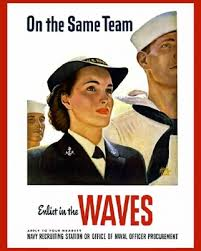 The use of the word Emergency signified that US Navy brass thought female service would cease when the war ended due to political resistance from many who did not believe women had a place in the US Navy. Despite the resistance from conservative officers, the demand was clearly there. 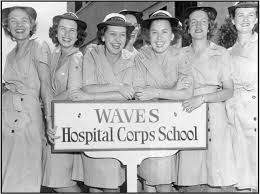 By mid-1943, 27,000 American women served in the WAVES. These women took up far more responsibilities. Secretarial and clerical jobs still made up a large portion of WAVES positions, but thousands performed jobs such as aviation mechanics, photographers, control tower operators, and intelligence personnel. 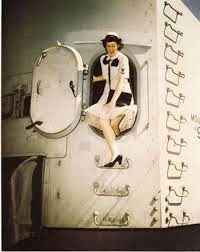 By the end of the war, over 84,000 women served in WAVES with 8,000 female officers. Entire staffs of men disappeared because women took over airfield control towers, manned vital naval communications networks, and served important roles in health and hospital work. Women trained in gunnery and blind flying instruction, aerology, aviation ground crew work, navigation and other fields. The Navy estimated that WAVES freed enough men to outfit an entire task force of 1 battleship, 2 aircraft carriers, 2 heavy cruisers, 4 light cruisers and 15 destroyers. 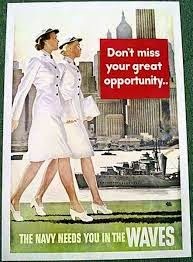 The Navy placed women in both mundane and dangerous activities. They operated all the laboratories and many of the firing bays at the crucial Indian Head rocket powder plant which conducted testing of American rocket propellants. They fixed aircraft, packed parachutes, provided weather information, served as link trainers, gunnery instructors, coordinated air traffic control and performed a host of other aviation-related jobs. After the war, do you think these women were content to going back to being housewives? They changed the thinking of the nation about women’s place in society. 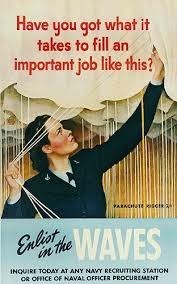 At war’s end, Congress passed the Women's Armed Services Integration Act on 12 Jun 1948, allowing women to gain permanent status in all military branches of the United States. This put the WAVES program into obsolescence, but opened the way for women’s continued advancement in society. My book, ANGEL WITH STEEL WINGS, releases late March or early April, 2015. ANGEL WITH STEEL WINGS is a World War II romance where Steel Magnolias meet Band of Brothers. Mandy McCabe escapes her dead-end life in Hangman’s Hollow, Tennessee, by becoming a Woman Air Force Service Pilot. Major Harvey Applegate lost his wife to the WASP program, and he’s convinced Yankee Doodle Gals have no place flying in the war effort. He determines to protect the remaining ladies by sending them packing back to the home front. Can Mandy save the WASP program on Harvey's base? Both Mandy and Harvey experience immediate attraction which increases Harvey’s desire to send Mandy home to safety. One love. Two goals. Someone has to give. ANNE GREENE delights in writing about wounded heroes and gutsy heroines. Her second novel, a Scottish historical, Masquerade Marriage, won three prestigious book awards. The sequel Marriage By Arrangement, finalled in a number of contests. A Texas Christmas Mystery also won several awards. Look for Anne’s new World War II historical romance, Angel With Steel Wings, early in 2015. The first book in Anne’s lady detective series, Holly Garden, PI, Red is for Rookie, débuts later in 2015. Anne’s highest hope is that her stories transport the reader to awesome new worlds and touch hearts to seek a deeper spiritual relationship with the Lord Jesus. Anne makes her home in McKinney, Texas. She loves to talk with her readers. 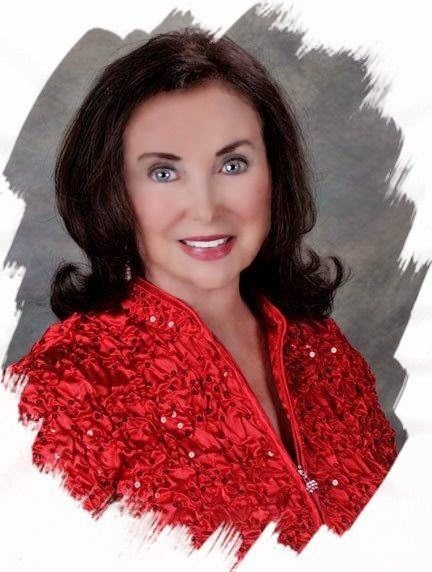 Buy Anne’s books at http://www.Amazon.com. Talk with Anne on twitter at @TheAnneGreene. View Anne’s books, travel pictures and art work at http://www.AnneGreeneAuthor.com. Learn more about Anne as well as gain tips on writing award-winning novels at http://www.anneswritingupdates.blogspot.com. You can bet on it! If I had been older than 7 or 8, (an adult :)) I would have joined the WAVES in a heartbeat. I fantasized about them and wrote stories for my paper dolls with my female doll being a WAVE and even drew an uniform for her from what I'd seen on a poster much like the poster with the girls in white. Two of my mother's cousins were sailors and I thought they were the most handsome men I'd ever seen in their uniforms. Naval officers still bring back those memories. I loved the star of JAG, Not only handsome, but also a Navy officer. I doubt any of them were content to going back home to be housewives, but even then the opportunities for women were not as abundant as they are now. Women were teachers, nurses, and secretaries not engineers, lawyers, doctors or corporate executives. The ones who had worked in the factories here or had specialized training in the the WAVES were soon displaced by returning soldiers or couldn't find a job utilizing their training. Yes, we've come a long way. Hi Martha! I would join the military today if I could. Too late for me though. WRiting is the next best thing. Right? Love visiting with you here! Thanks, Martha, for the interesting post. I probably would have wanted to join the WAVES; however, my dad was a career military man and he wouldn't have allowed me to do so. He made that absolutely clear to me, once when I suggested that I might like to join. Otherwise, he was pretty open to what career path I might choose.